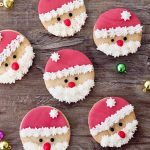 Santa Claus Sugar Cookies are the ultimate addition to your Christmas cookie tray. Fun and easy to make with refrigerated cookie dough and fondant, they're almost too cute to eat! Using a rolling pin, roll the refrigerated dough (or your cookie dough from scratch) to about 1/4-inch thick. With a cookie cutter, cut into circles. Arrange dough in a single layer on a baking sheet and bake in the oven according to recipe or package directions. Allow to cool completely. Sprinkle some cornstarch on a clean working surface, as well as on the rolling pin. Roll out the fondant to about ¼-inch thick. Using the same size cutter for the cookies, cut out 6 fondant circles. Cut each circle in half and press the demi-circles fondant onto the cookies to resemble Santa’s hat. In a bowl, combine, butter, sugar, and milk. Beat at medium speed, gradually increasing to high until smooth and form stiff peaks. In a piping bag fitted with a star tip, spoon in buttercream frosting. On each cookie, pipe a border around the edge of the fondant to resemble “fur”. Pipe a small dollop on the top of fondant to resemble a pompom. Pipe on the lower edge of the cookies to make a beard. Using the red decorating frosting, pipe a small dollop to resemble a face. Using the black frosting, dot two eyes between the beard and the hat.